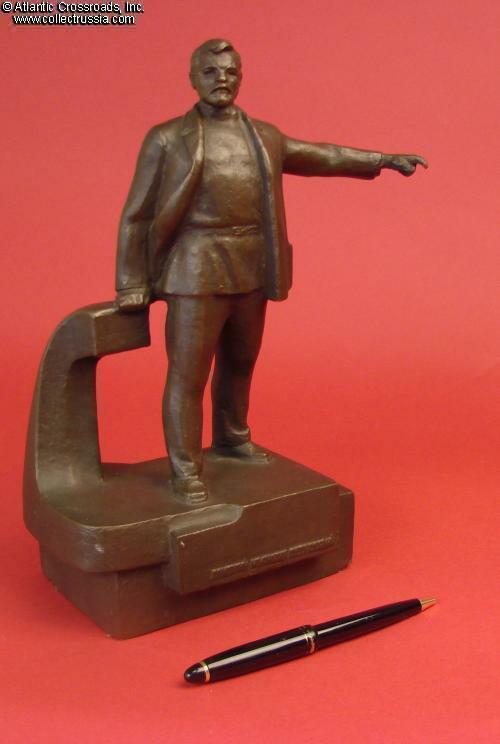 Model of the Monument to Petrovsky in the city of Dnepropetrovsk, circa 1960s. 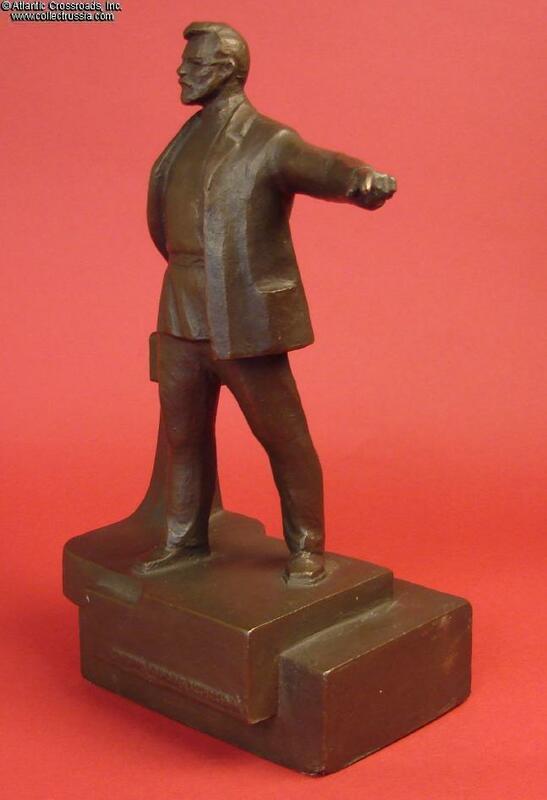 In solid bronze; measures approximately 10 ¾" tall (27 cm); the base is 3½" x 5 ½". This very massive and impressive piece weighs 9 lb! The plinth shows raised lettering "Grigory Ivanovich Petrovsky". The plinth is hollow, filled with what looks like wood pulp, and has a piece of soft cloth attached at the bottom to protect the shelf. 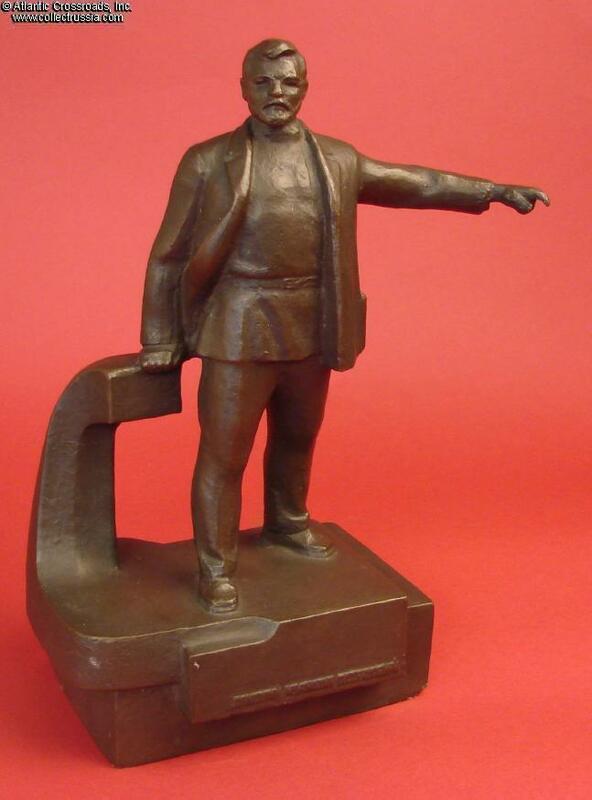 The statuette is in excellent condition; shows only normal age and a minor bump to one of the lower corners of the plinth. Grigory Petrovsky was an industrial worker in the Ukraine who became one of the early Bolshevik allies of Lenin in the communist underground prior to the Revolution. In the early 1900s he was repeatedly arrested by the Okhrana, and after fomenting the failed armed rebellion in the large industrial city of Yekaterinoslav in 1905, had to flee the country. 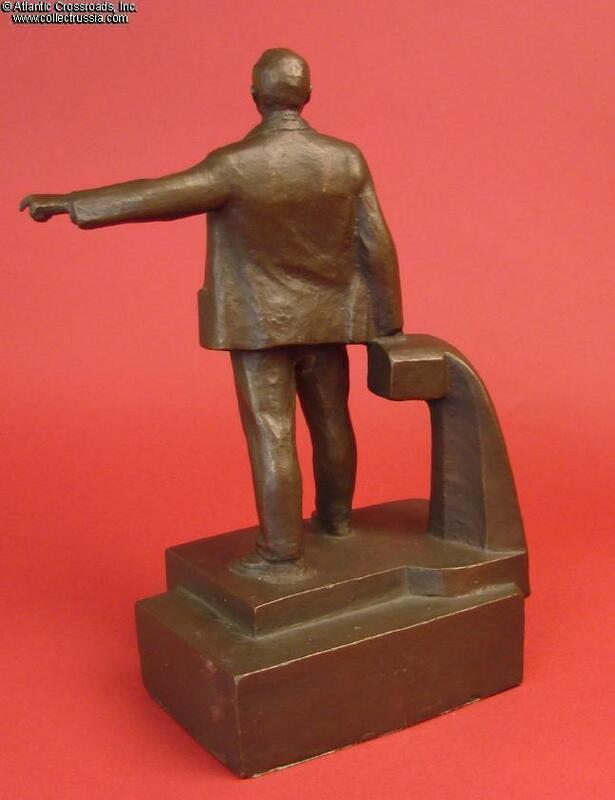 He later returned to take Lenin's side in the Central Committee of RSDRP, became chief editor of the Pravda, and was even elected to be a Yekaterinoslav representative in the Duma (the nascent Russian Parliament) thanks to his pro- Ukrainian activism. When WW1 broke out, he was arrested again for subversive activities, convicted, and exiled to Siberia (comfortably enough, not to a death camp of course!) He was released in 1917 right after the fall of the monarchy, in time for the Bolshevik revolution later that year and the subsequent Red Terror - which he, among others, signed into law. Notably, Petrovsky was also one of the signatories of the Treaty of Brest-Litovsk with Germany. Later he helped to organize forced collectivization in the Ukraine - and the mass starvation that came along with it. Almost miraculously, during the Stalin's purges Petrovsky escaped the fate of most other early Bolshevik leaders. He was however sidelined and stripped of all leadership posts in late 1930s. 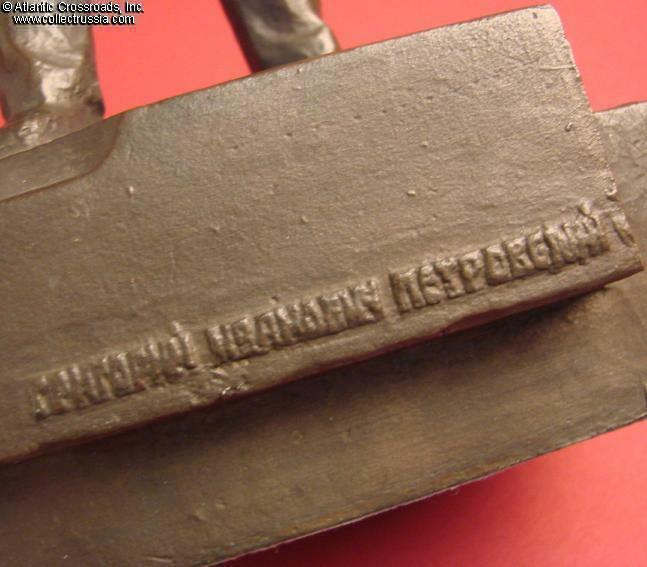 When he died in 1958, his Communists credentials had remained relatively unblemished, so he was eulogized as a hero, and Yekaterinoslav was renamed in his honor Dnepropetrovsk (which means something like "city of Petrovsky on the Dnieper"). 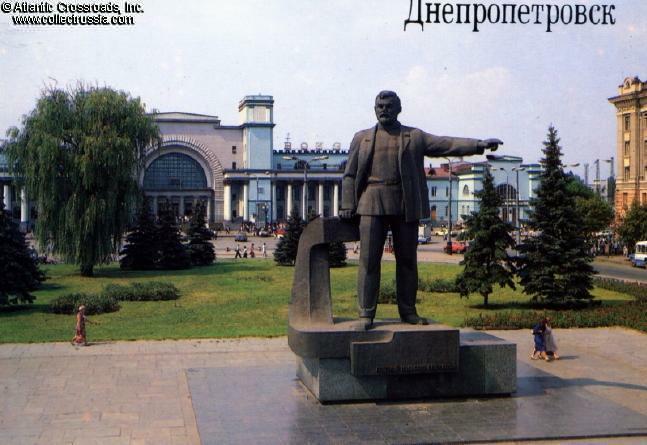 Interestingly, the huge monument to Petrovsky near the Dnepropetrovsk main railway terminal had remained intact long after the fall of the Soviet Union. 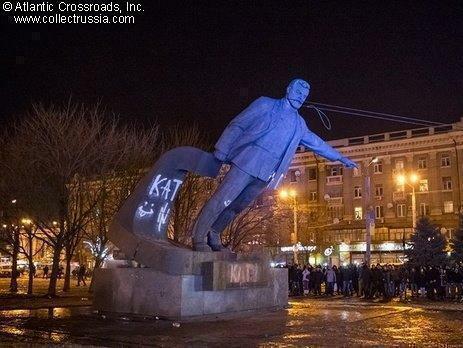 It was finally removed only in January 2016 as part of the recent "de- Sovietization" campaign. It is worth mentioning that the city had remained Dnepropetrovsk for a while thanks to a stroke of semantic genius: the local authorities declared that it was now named in honor of St. Peter, not the Communist Petrovsky - and thus saved enormous amount of money on renaming it once again! Ultimately, the ruse didn't work, and it recently got the new name Dnipro (or Dnepr in Russian) after the river on which it stands. This seems like a rather bland choice for a city name, so we won't be surprised if it will be changed again in not so distant future.